Today, I’m sharing a digital piece that I made for Enchanted Visions. It’s not up in the gallery there yet, as this is for the new theme, In Between. The gallery will be created this coming week and you’ll be able to view it there, as well as all the art that the other Enchanted Visions artists created for it. I hope you’ll visit the gallery as the art is truly spectacular. This represents the in between moments of a girl growing into womanhood, when you look at them and for an instant you see the beautiful woman they are becoming. If you’re waiting for our weekly Enchanted Visions interview, never fear, it will be here very soon, so please check back later today or tomorrow. 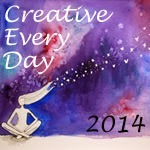 Posted in Creative Every Day, Enchanted Visions, mixed media, portrait and tagged digital art, fantasy art.